What is the best concrete polisher on the market today? That’s exactly what we will try to answer here. We have taken 5 top rated concrete and stone polishers (both wet and dry) and delved deep to give you the full low down on each. For our findings at a glance, just head to the table below. For an in depth review of each of our top 5 picks, plus a dedicated buyers guide, keep on reading. There are different types, models, variants, and brands of concrete polishers and it is sometimes difficult to compare them based on their work output alone. For this reason, specific criteria are used to rate concrete polishers, and these criteria are cost-performance ratio, finish quality, product design quality, ease of maintenance, safety profile, and ease of use. Using these criteria, 5 of the best concrete polishers have been selected for review. Among these 5, the best concrete polisher is singled out and identified appropriately as our top pick choice below. This is a versatile and high-quality hand-held, single-disc concrete polisher that is powered by 127-volt AC power. It is well suited for wet stone polisher and comes with a 4-inch electronic wet-stone Polisher (model number PW5001C-R) and a well-fitting head cover (model number 417322-5). This concrete polisher is made by Makita Tools, a U.S-based franchise of the globally renown power tools manufacturer, Makita Corporation. The Makita PW5001C has a compact design with a cylindrical body onto which is fitted a (rectangular) cuboid polishing head unit. The polishing disc is attached to the underside of this polishing head unit. This lightweight polishing machine weighs 8.4 pounds, and measures 16 inches in length while its square-like cross-section measures 6 inches by 5.5 inches. The compact ergonomic design of this concrete polisher makes it an easy-to-use device, with its durable housing encasing its internal components, including the industrial-grade die-cast aluminum gear system. Its common fittings allows popular water hoses to be connected to the polisher, with 3 holes located at the top of the spindle allowing water to be spread evenly onto the pad hence ensuring that the pad does not clog. There is also a side handle, which allows the user to have a steady grip on the polisher. However, its front handle does not flip-up and this prevents the worker from getting the head unit of this polisher into tight spaces over-head. The polishing disc used on the Makita PW5001C is 4 inches in diameter, and can achieve a load-free speed of 4,000rpm within the first minutes after the polisher is turned on. The water feed valve connected to the common fitting of the polisher is made of solid brass, and this allows it to control rate-of-flow for a long time without developing rust or being corroded. The PW5001C is electrically-powered with a 7.9 amperes AC motor under the hood. This is able to deliver an impressive maximum disc spinning speed of 4,000 revolutions-per-minute(rpm). The speed dial allows for speed control within a range between 2,000rpm and 4,000rpm. The resulting electronic speed control allows this polisher to maintain constant speed regardless of its load. There is also a soft-start feature which allows the polisher to achieve smooth start-ups. The electric cord that routes power from the 127-volt AC power socket to the 7.9amp motor, emerges from the cylindrical body of the polisher and terminates into a GFCI plug. There is also an overload switch protects the armature of the motor from failure during periods of high current supply (overloads). The most unique aspect of the Makita PW5001C is its hook-and-loop feature which allows accessories and other attachments to be easily fitted onto the polisher. The motor weighs a mere 5.1 pounds, which enables this polisher to have a high power-to-weight ratio (about 1.72) that minimizes the degree of operator fatigue during use. The polisher is shipped alongside a 4-inch wet-stone polisher, head cover, rubber pad, wrench, dust cover, and an easy-to-follow operating manual. Moreover, Makita Tools provides a 12-months warranty for this model. Can achieve a glossy and high-quality ground finish. Can produce an excellent light finish. Has a compact ergonomic design. Front handle does not flip up. 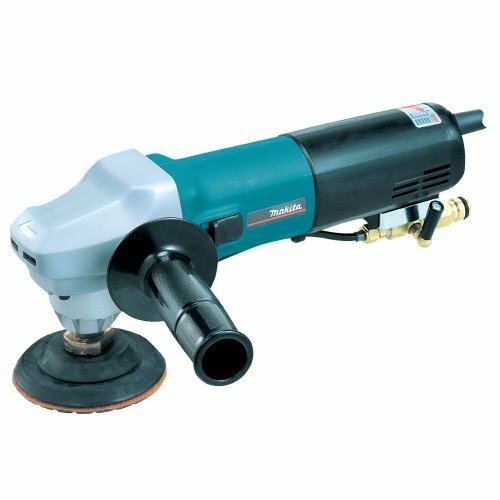 The Makita PW5001C is a high-performance, versatile and high-quality hand-held, single-disc concrete polisher. With a powreful variable speed 7.9 amp-motor that can deliver disc spinning speeds of 4,000 rpm, you have a tool that can handle most concrete and stone polishing tasks. In our opinion, the high cost-performance ratio, exceptional finish quality balanced with easy-to-use features make the Makita PW5001C the number one best concrete polisher in our review round up. The Hardin H38WV is a high-quality, portable single-disc concrete polishing kit that is powered by a 950 Watts 8.29-Amp variable speed AC motor. It is well suited for polishing stone counter-tops as well as profiling stone floors. As the name suggests, this concrete polisher is made by Hardin. Similar in style to our top pick Makita, the Hardin H38WVPOLSET has a compact design with a cylindrical body onto which is fitted a (rectangular) cuboid polishing head unit. On the polishing head is fitted an adjustable auxiliary (bail) handle. The polishing disc is attached to the underside of this polishing head unit. This is a lightweight polishing machine weighing in at 9.8 pounds. It measures 14.5 inches in length while its square-like cross-section measures 6.5 inches by 6 inches. The compact ergonomic design of the Hardin makes it an easy-to-use polisher, with its durable housing encasing its internal components. It features a well-positioned side handle, which allows the user to have a steady grip on the polisher through out the work process. The polishing disc used on the tool is 4 inches in diameter, and can achieve a load-free speed of 4,000rpm. That being said, optimal polishing for most applications can be achieved at 2500rpm. The Hardin pads kit includes both marble and granite pads. These pads have a grit value that range from 50-grit to 3,000-grit. There is also a 10,000-grit buff pad. Furthermore, the pads in this kit are of standard diameter of 4-inches, while their thickness is 3mm. The marble and granite pads feature a soft resin bond which allows them to release their diamond sands at the right rate when they are working on hard materials. The profile wheel of this model is the standard vacuum brazed wheel whose radius is 3/8 inches. This profile wheel can be used to profile stone edges of counter-tops or concrete slabs. Further decoration can be achieved using the 1/4-round bull-nose which can shape slabs well. The Hardin H38WVPOLSET is electrically-powered with its 8.29 amperes 950-watt AC motor. The full speed range of this polisher is 700rpm to 3,000rpm. However, the speed dial allows for speed control within a range between 2,000rpm and 4,000rpm. The resulting electronic speed control allows this polisher to maintain constant speed regardless of its load. Its electric cord which routes power from the 120-volt AC power socket to the polisher emerges from its cylindrical body and terminates into a GFCI plug. Unlike the PW5001C polisher which comes without a water hose, the Hardin H38WVPOLSET comes with a 5-feet, 1/4-inch water-line that can be easily attached to any standard (or popular) 5/8-inch garden hose. This is because the water-line features a 5/8-inch brass coupler at its end. This model can be easily disassembled into its constituents parts, which allows for easy replacement of parts as well as efficient troubleshooting of technical faults. The polisher is shipped alongside a bail handle, vacuum-brazed profile wheel, spindle wrench, and side handle. It also comes with extra carbon brushes. Range of operating area limited by cord length. The Hardin H38WVPOLSET is a high-performance, versatile and high-quality portable single-disc concrete polishing kit. With a variable speed AC motor capable of spinning speeds of 4,000 rpm, you have another powerful polisher on your hands with this one. Highly recommended. The DWP-1257 is a high-quality, high-performance, and portable single-disc wet polishing kit that is powered by a 800 Watts 7-Amp variable speed AC motor. It is well suited for polishing stone and concrete counter-tops as well as concrete floors. The polisher is made by DAMO Diamond-Tools, LLC. The DAMO DWP-1257 has a compact ergonomic design with a cylindrical body onto which is fitted a cuboid polishing head unit. Similar to the two polishers reviewed above, the polishing disc on the DAMO is attached to the underside of the polishing head unit. These dimensions make it slightly larger than Hardin even though both polishers are of the same weight. Even so, the compact ergonomic design of the DAMO DWP-1257 makes it an easy-to-use polisher, with its durable housing encasing its internal components, including its gear assembly. The tool uses a common fitting featuring a water valve that is connected to a short water hose. To connect this water hose to popular garden hoses, a faucet and garden hose adapter are provided. Also included in the water routing system is a splash guard which needs to be installed when polishing because it prevents water from splashing into the motor unit. If water splashes into the motor unit, the GFCI power protection is activated and it promptly shuts down the motor, and one cannot reset it till the motor is dry completely. This safety precautions causes delay in polishing work, hence the need for splash guard installation before work begins. The polishing disc used on the DAMO DWP-1257 is 5 inches in diameter. It is spun by an electrically-powered 120 volts 7-amp AC motor which can deliver a maximum load-free speed of 3,000rpm. The full speed range of this polisher is 700rpm to 3,000rpm. The speed dial allows for speed control as well as works alongside the variable-speed control switch to run the automatic speed-feedback system which maintains constant speed regardless of the load. There is also a well-positioned lock-on switch provides for greater flexibility during use. Polishing pads are fitted onto the polishing disc. The pads kit for the DAMO DWP-1257 includes 7 diamond polishing pads of different grit grades from 50-grit to 3000-grit. The tool is also shipped alongside a side handle and a carbon brush set. Can only work on wet applications. The DAMO DWP-1257 is a high-quality, high-performance, and portable single-disc wet polishing kit. There’s slightly less RPMs under the hood when compared to the choice products reviewed above; however for the price the unit comes highly recommended. Number 4 in our list is this high-quality, high-performance, and portable single-disc wet polishing kit. It is powered by a 900 Watts 110-volt variable speed AC motor and is well suited for polishing stone and concrete counter-tops as well as marble and granite surfaces. This concrete polisher is made by Asia Pacific Construction. This wet polishing kit has a compact ergonomic design with a cylindrical body onto which is fitted a cuboid polishing head unit. Similar to the Hardin H38WVPOLSET and the Makita PW5001C, its polishing disc is attached to the underside of the polishing head unit. owever, unlike the DAMO DWP-1257, this wet polishing kit features a bail handle. Unlike the 3 concrete polishers reviewed above, the Asia-Pacific Construction Polisher Kit is heavy, and on average, it weighs about 50.3 pounds, which makes it an extremely cumbersome polishing machine for normal household polishing functions. The Asia-Pacific Construction Polisher Kit uses a common fitting featuring a water valve that is connected to a short water hose. To connect this water hose to popular garden hoses, a garden hose adapter is provided. The polishing disc used in this wet polishing kit is 5 inches in diameter. It is spun by an electrically-powered 110 volts AC motor which can deliver a maximum load-free speed of 4,500rpm. This wet polishing kit comes with a comprehensive 9-piece pad kit that contains the following pad grades; 30-grit, 50-grit, 100-grit, 200-grit, 400-grit, 800-grit, 1500 grit, and 3000-grit, as well as a 10000-grit buff. Also, this model is shipped alongside a 4.5-inch diamond-segments, double-row grinding cup-wheel. It also comes with a 5-inch rubber velcro backer that serves as a pad holder. The Asia-Pacific Construction Polisher Kit is also shipped alongside an easy-to-follow instructional DVD manual that explains to the user how to properly use this kit, as well as what to do to achieve optimized results using the provided components. Variable speed control with good levels of rpm. Heavy and cumbersome to use when compared to other polishers in our list. The Asia-Pacific Construction Polisher Kit is a high-quality, high-performance, and portable single-disc wet polishing kit. Capable of delivering disc spinning speeds of up-to 4,500 rpm, this is another tool with a substantial amount of power under the hood. The comprehensive selection of included pads is another reason to sing the praises of the tool. Do bare in mind the bulkier design however. The SWP101K is a high-quality, high-performance, and portable single-disc wet polishing kit that is powered by a 800 Watts 110-volt variable speed AC motor. It is well suited for concrete and stone wet polishing; and can also be used for light dry polishing. This polishing kit is made by Stadea. The SWP101K has a compact ergonomic design with a cylindrical body onto which is fitted a cuboid polishing head unit. The tool is a lightweight polishing machine that weighs 9 pounds, and measures 17 inches in length while its rectangular cross-section measures 7.5 inches by 6.2 inches. The compact ergonomic design of the Stadea SWP101K makes it an easy-to-use polisher, with its durable housing encasing its internal components, including its gear assembly. This wet polishing kit features a dual front handle made up by a Top D-Handle which is used for stone fabrication, and a general-purpose side handle. It also has an arbor lock button that allows the user to change components, as well as attach or remove accessories without needing to use tools. Just like the DAMO DWP-1257, the SWP101K uses a common fitting featuring a water valve that is connected to a short water hose. To connect this water hose to popular garden hoses, an inbuilt quick-connect faucet and garden hose adapter are provided. Also included in the water routing system is a splash guard which needs to be installed before polishing as it prevents water from splashing into the motor unit and thereby activating the GFCI power protection which promptly shuts down the motor, and forces the worker to wait till the motor dries up before it can be reset. The polishing disc used in the Stadea SWP101K is 5 inches in diameter, and is spun by an electrically-powered 110 volts AC motor which can deliver a maximum load-free speed of 3,000rpm. The full speed range of this polisher is 700rpm to 3,000rpm. Its electric cord that routes power from the 110-volt AC power socket to the polisher emerges from its cylindrical body and terminates into a Class-A GFCI plug. This cord is about 12 feet long. There is also a well-positioned power lock switch. Incorporates a Class-A GFCI safety feature. The water control valve is poorly designed. Works best on wet applications. The Stadea SWP101K is a high-quality, high-performance, and portable single-disc wet polishing kit that is powered by a 800 Watts 110-volt variable speed AC motor. The features makes it well suited for concrete and stone wet polishing and another worthy addition to our top 5 round up. The concrete polisher is used to finely grind and smoothen concrete surfaces so as to achieve a high-gloss finish. Using one of these tools is considered to be the best way to polish concrete. It is also the fastest and most efficient way. The glossy finish achieved when using a concrete polish can retain its shine without waxing or coating it. This makes concrete polishing the most economical alternative to flooring the surface with pricey granite or marble so as to achieve a mirror-like finish. Polishing ensures that the concrete surface achieves a smooth and shiny finish. It therefore has a decorative value, with the degree of decorative shine on the surface determined by the type of polishing pad used. The 3 main types of polishing pads used with concrete polishers are the soft pad, the rigid pad, and the dry/wet pad. Soft pads use a rubber backer to attach onto the polisher disc, and they can polish contoured surfaces well. Rigid pads are attached to the polisher disc using a quick-release mechanism, and they polish much quicker than soft pads though they can gouge surfaces if the pads are not held absolutely flat. The dry/wet pads are designed to fit onto high-speed angle grinders and use quick-release mechanism to attach onto the grinder disc. The polishing process can be preceded by concrete grinding. Grinding flattens the concrete surface, as well as cleans it of hardened grit. This leaves behind a flat concrete surface that is ready for polishing. Thereafter, a grit pad (usually the lowest pad of 60 grit) is fitted onto the polishing disc in readiness for the first stage of polishing. There are three grades of concrete finishing. When well-prepared concrete mix is poured properly onto its mold or onto the surface, its top-most layer settles into a cement paste which gradually forms a uniform layer as it dries, and then acquires a uniform solid color. When it dries completely, it produces what is called a cast finish. When this cast finish is polished very lightly, the cement layer is gradually pared down to reveal the fine sand embedded in the concrete matrix, and this grade of finish is described as light finish. If the polishing process continues, the rock aggregate in the concrete matrix is exposed, and this grade of finish is described as the ground finish. The thickness of the layer removed from the cast finish till the ground finish is achieved is normally 1/16 (0.0625) inches. This can be achieved using a variable-speed concrete polisher fitted with diamond sanding disc(s). generally, a 60-grit sanding disc (pad) is used to create a ground finish, while a 3000-grit pad is used to create a light finish. Generally, concrete polishers are water-fed and this necessitates them to have a universal fitting that can accept standard water hose connections. Water is used to cool the pads of the polisher as well as minimize dust generation. However, the use of water does raise minor safety concerns. Because concrete polishers are electrically-powered, the use of water to cool its pads raises the possibility of electrocution if the polisher is not well grounded, and for this reason it is recommended that one acquires a polisher that has a Ground-Fault Circuit Interrupter (GFCI). Even so, the worker still needs to wear rubber gloves as an added safety precaution. Likewise, the worker must wear a fully-working particle mask so as to prevent the caustic concrete dust from irritating your face, airways and eyes.